At The Academy, the emphasis in March and April is “Green Your Scene.” So in March, we’ll be focusing on keeping the planet green, recycling, and reusing. We want to teach our children to be mindful of things like littering and to learn how recycling helps the environment. At home, you can help reinforce the idea of recycling. First, explain to your child why you separate the trash and then enlist his or her assistance in putting the recyclable items in the right bin. Additionally, you can help your children think about reusing things. When they outgrow a pair of shoes, for example, help them think of a younger friend or relative who could use the shoes. Or talk about how Goodwill or a “charity closet” reuses donated items. When you have gathered enough items, take your child with you when you go to donate. Here’s a simple project you can do at home with 3- and 4-year-olds. It reuses an empty water/soda bottle. 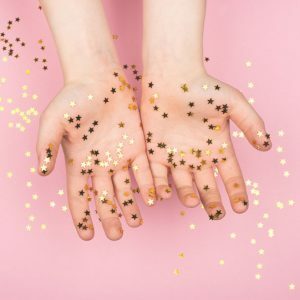 Add these things to the bottle with your child: alphabet beads (search for “alphabet beads” on Amazon), some glitter, sequins or any tiny sparkly things. Then fill half the bottle with water and the other half with light colored corn syrup. When finished, attach the top permanently using a glue gun. Now for the fun: shake it up and watch the pretty water! Now for the learning: challenge your child to find each letter of the alphabet and write down each one found. The Academy is widely considered the best preschools Nashville has to offer. We invite you to learn more by scheduling a tour. With 11 preschool locations throughout middle Tennessee there is always an Academy location convenient to where you live or work. Check out all of one of our 11 convenient preschool locations throughout middle Tennessee.